Fans swooned over Warpaint’s hour-and-a-half long set that closed the second night of “Love You Down,” a mini-fest that took over the Echoplex and Echo on February 7 and 8. The scene was very “L.A.” with local bands taking the stage and plenty of familiar faces in the audience. And with a sold-out second night of Warpaint and Swimm headlining performances, proof that these acts are near and dear to the hearts of locals was evident. Frontwoman Emily Kokal shared how amazing it was that the band was still together, a sentiment that deeply resonated with the crowd. The foursome have had successful performances at big-name festivals like Desert Daze and Coachella, but this packed-in performance was really something special. Fans cheered, shouted “we love you!” and sang along to every last word of their perfectly-crafted setlist. The group pulled on nostalgia this time, playing mostly songs from their self-titled album and The Fool. The members were formed pretty much in a line on the stage, making it easy to see each of them clearly, depending on where you were standing. Emily, Jennylee and Theresa took turns moving closer together and beaming and laughing at each other while they were playing, and the amount of fun they were having on stage was infectious. Slower songs like “Shadows” and the stunning, drawn-out “Drive” pulled at our heartstrings while songs like “Elephants” and “Disco//Very” had the crowd dancing. Swimm played an equally energetic set just before, inviting local rising star singer Lauren Ruth Ward to the stage for a song. Catchy songs like “Uh-Huh” and Tame Imapala-esque “Man’s Man” had the crowd dancing. A fan handed singer Chris Hess a bottle of vodka, which he took a large swig from, and a rose, which he returned to the crowd. During “Uh-Huh,” Jenny Lee of Warpaint joined the band on stage on tambourine. It really felt like one big party. 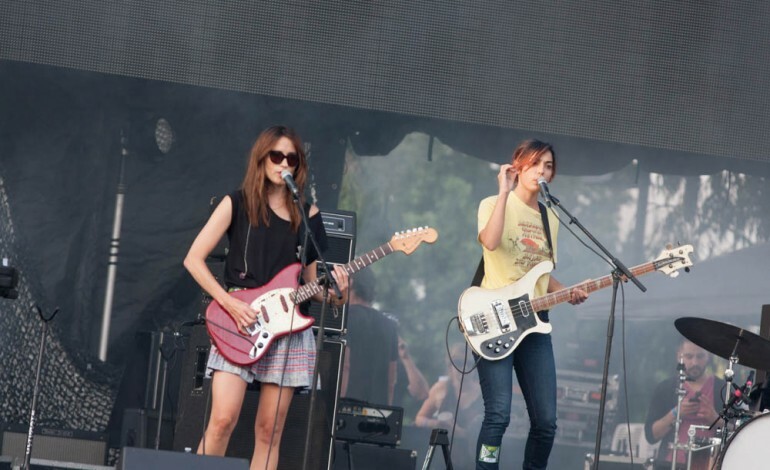 Each member of Warpaint performed in another project during the two-day fest, and on Friday that was Stella Mozgawa’s electronic project “Beef” which closed out the night, and Theresa Wayman’s “TT,” which also drew in quite a crowd as she let out her more pop-inspired sound. Earlier acts made ample use of local guitarist Andrew Martin, whose main project is another L.A. favorite, Moon Honey. The long and lanky, constantly moving guitarist joined high energy acts like Jeffertitti and Andy Clockwise on the Echo stages. Sego also drew in a crowd for their heavier set. VS Color performed a dreamy genre-bending set on the Echoplex stage.